Table view. Photo: Joe Linton See more of Joe's Parklet Pictures at the end of the post. 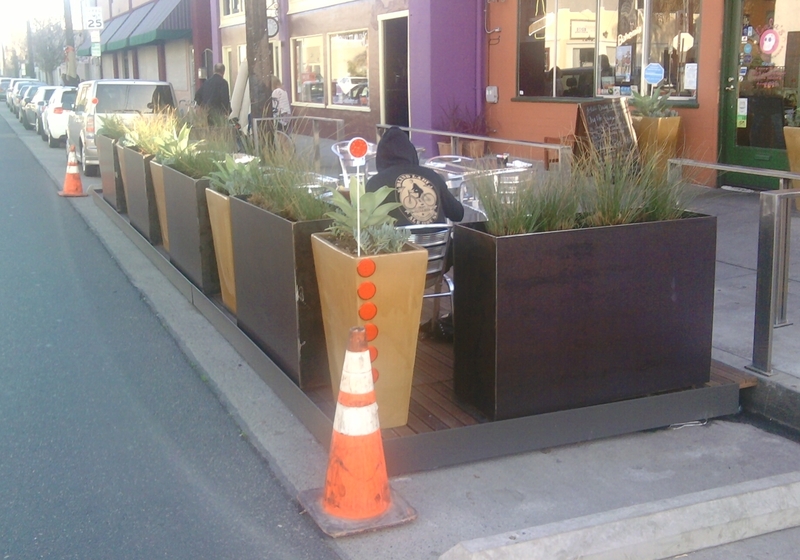 The way parklets work is that a curb parking space is replaced by a platform that serves as a mini-park. It’s a bit like a Park(ing) Day temporary park becoming a longer term mini-park. Parkets are fairly common in San Francisco, and now spreading all over, including, soon hopefully, Downtown Los Angeles. Long Beach’s Bicycle-Friendly Business District program was initially working with Retro Row businesses to look at more extensive, more permanent traffic-calming and place-making solutions, such as bulb-outs. The cost was prohibitive and the time frame long, so they settled on cheaper and more immediate measures. The parklet was designed by architect Michael Bohn of Studio One Eleven and was constructed by the contractor Jan Van Dijs. 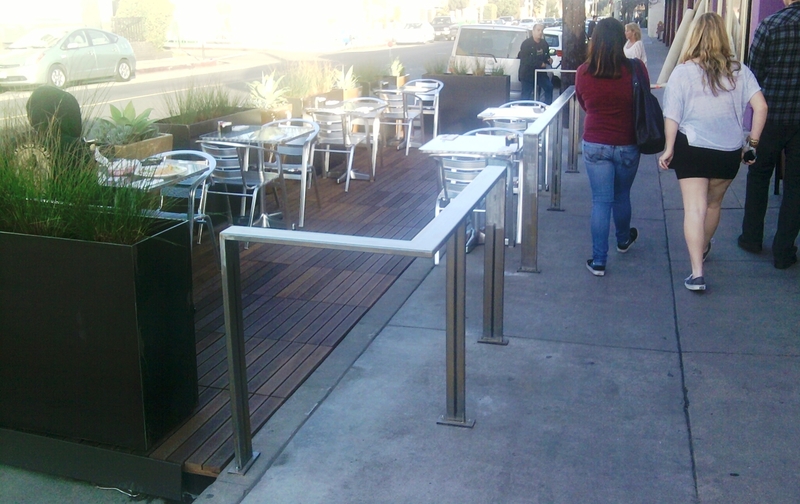 Studio One Eleven is working with two other Long Beach businesses to install two additional parklets expected this year: Number Nine and Berlin Bistro, both restaurants on Fourth Street. The platform is an adjustable off-the-shelf deck product from Bison Innovative Products. The flooring atop the pedestal is plans of sustainably harvested wood. Between the dining area and the street are a series of large planters, with alternating succulents and grasses. The design is simple and functional. On a cool late Sunday afternoon, though Lola’s restaurant was bustling indoors, only a couple of diners were out eating in the new parklet. Retro Row has a lot of pedestrians and cyclists, and sitting in the parklet makes for great people-watching in the middle of it all. Occasionally a loud motorcycle or fast-moving car interrupts the ambiance, but overall the new parklet presents a pleasant and delicious new experience. san francisco does this – it’s about time. In SF, the parklets are public parks, this one appears to be for customers only. I don’t know the full legal answer, but it’s probably more private space – or privately-controlled space like cafe sidewalk dining is. If you don’t order something they can probably kick you out. 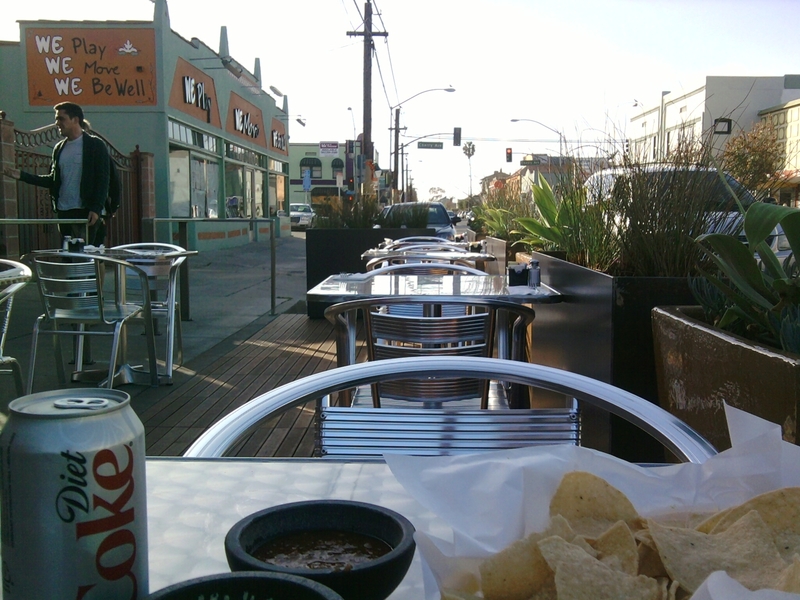 Eyes on the Street: Parklets Arrive In East L.A.